Your child would have brought back the 'Job Week' card on Friday, 24 February. We need your assistance to remind your child to keep it properly, as you will need to make a police report if the card is lost. 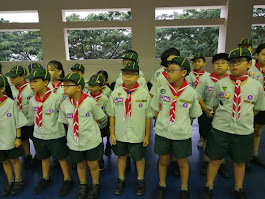 To encourage the Cubs to participate in this activity, they will get the Bumble Bee badge upon submission. Job Week is to inculcate the value of honest hard work. This is also a fund raising activity (Half the amount raised will used to cover expenses in SSA while the other half will be given back to the NYPS account parked in SSA), and we appeal to you to help give some jobs to your child to help him/her earn some money. Please note that the official Job Week period is during the March holidays. However, SSA had said that as long as it's a pre-arranged activity by the school, scouts are able to work outside of the stipulated period. I have informed our school staff that our Cubs might approach them to ask for jobs. Please do encourage your child to be pro-active in asking their teachers and relatives.